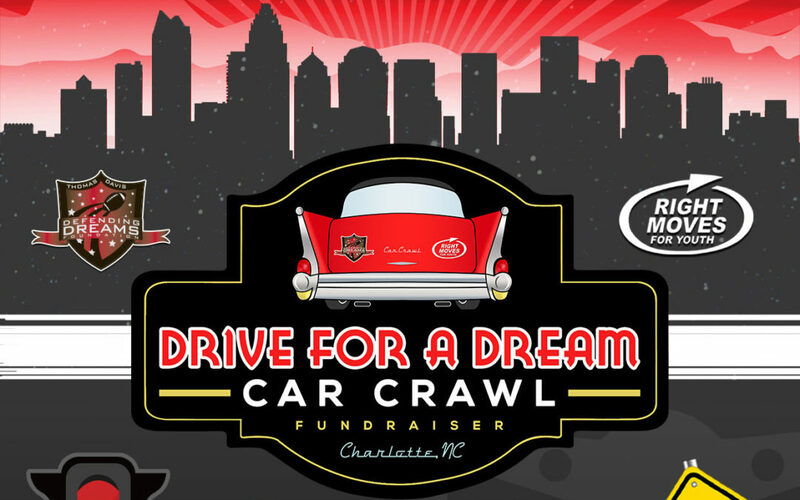 The Inaugural Thomas Davis Defending Dreams Foundation and Right Moves for Youth “Drive for a Dream” Car Crawl presented by NEXXA Transportation will be held on Saturday, October 27, 2018, from 8:30 a.m. – 3 p.m.
Charlotte Motor Speedway – you will not only pull into the infield but right into the NASCAR Monster Energy Cup Series Garage area. Guests will then be able to take photos with a special TBD car in Victory Lane. Bojangles Arena (Parking Lot) – Carolina Energy Arena Football Players will be there to demonstrate their sport and interact with guests. There will be football throwing games for guests to participate in. 1:00 PM – American Burger Co. – once guests have visited those three locations, they head back to the American Burger Co for a good old-fashioned cookout with Thomas Davis! Hamburgers/Hot Dogs and 2 drink tickets per person are included with your registration. Several of Thomas Davis’s football friends are expected to attend as well! Grand Prizes and raffle prizes will be drawn and the silent auction will wrap up. The outdoor party will be tented and a DJ will be spinning tunes. There is ample parking at all locations and celebrity hot rods will be on display. Schedules permitting, athlete celebrities are expected to participate at various locations and several of their cars will be on display for photo ops.